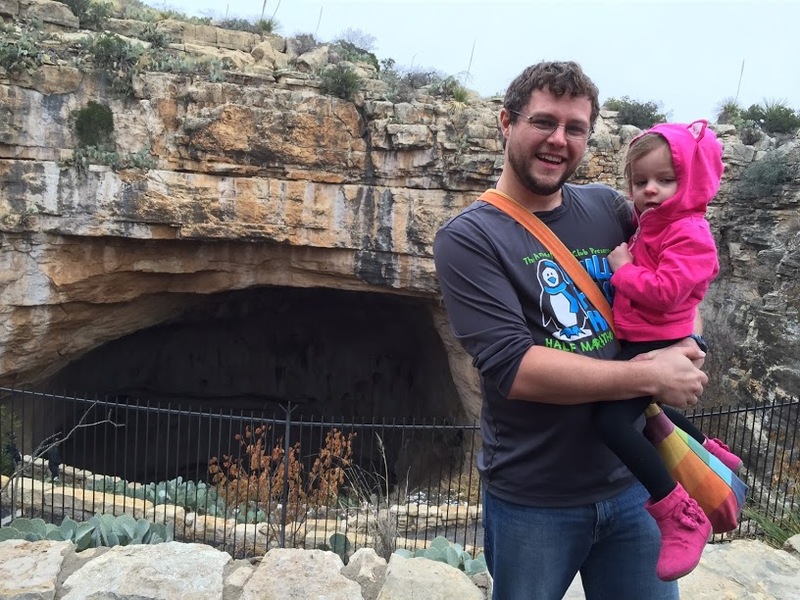 Looking for a place to take our two girls during a cold winter morning, ended up with us heading down the road to Carlsbad Cavern in Southeastern New Mexico. The caverns are iconic in more ways than one despite being only the 5th largest in North America, the name alone conjures up images of massive rooms of beautiful ice cycle shapes flowing form the ceiling, columns and curtains of rock like waterfalls, and vistas of sweeping underground rooms. Rightly so. You get all of these from Carlsbad Caverns along with a nice and toasty visitors center. Which was great on a cold day. The caverns themselves stay at a pretty constant 56ºF, and you have two choices of entry, the natural entrance and an elevator that takes you down into the big room. We opted to go in the natural entrance and hike down the one and a quarter mile trail to the big room. It was more than a little cold on the 5 minute walk from the visitors center to the natural entrance, but the view was well worth the brief discomfort. During the summer this spot is an amphitheater to watch the bats come out of the cave at dusk. Switchbacks took us down into the cave and out of the wind. The natural entrance normally closes around 3 pm, but the weather got nasty quick while we were in the cave and this entrance ended closing before one from ice. The light from the entrance showed the path for the first few hundred feet before artificial illumination took over. 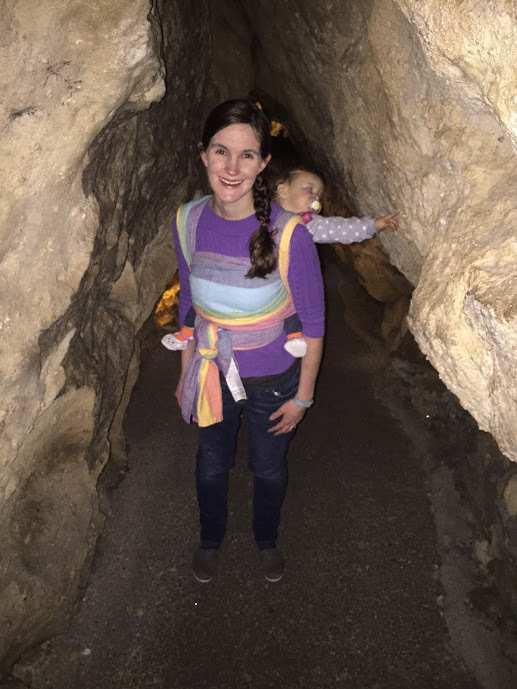 After getting warmed up down in the cave our two year old wanted to walk and run between all the formations that she could see. The trail was well paved with a steep slope, which she managed to navigate without falling. 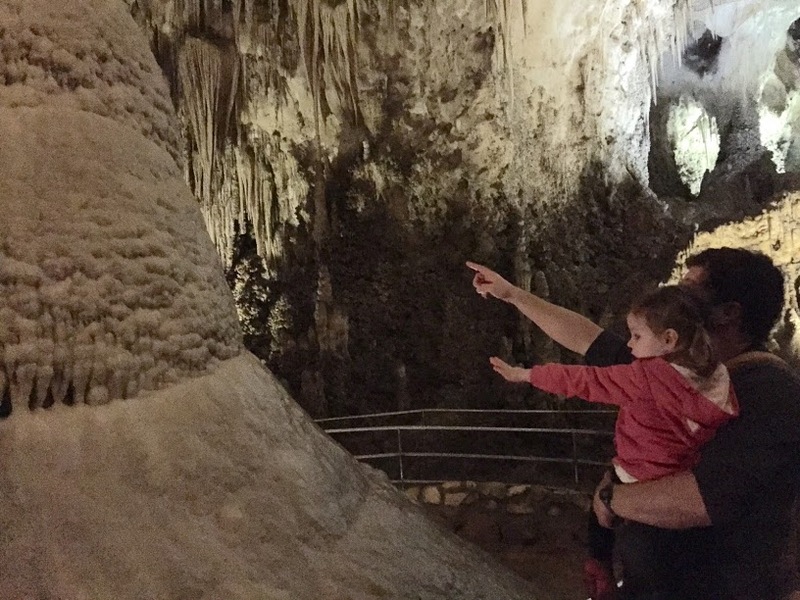 Not long into the trip and she almost mastered saying stalactite and stalagmite, column and drapery, pop corn and soda straws – the last two came pretty quick. The trial is not terribly long. Both the trail around the big room and the entrance trail are only 1.25 miles, but for a toddler that is quite a distance to travel. The rock formations kept her interest, but eventually her legs just gave out. Unsurprisingly, I ended up carrying her. We normally take our back pack along, but today we had gone with out. So instead, she lay across my arms looking at ceiling and the stalactites hanging down. After finishing up the loop trail, we took the elevators back up to the surface. The cafe offers up locally sourced food options that tasted pretty good after a long hike. The girls played a little more, and we got a few souvenirs for them before scraping the ice off the car (how fast can the weather change?!) and heading out. 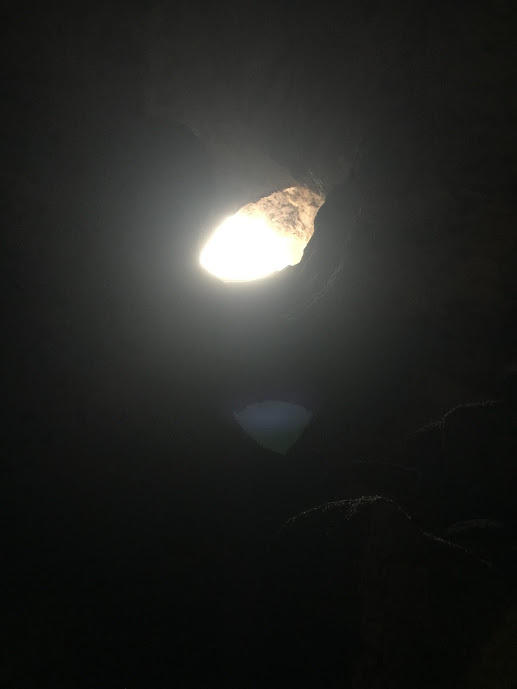 On the way back that same thought that passes everyone’s head who goes down into a cave with modern conveniences passed through our heads, what was it like for Jim White as a boy to explore a cave with a homemade wire ladder and a head lamp? And how grateful was he every time he got out and saw daylight streaming down? 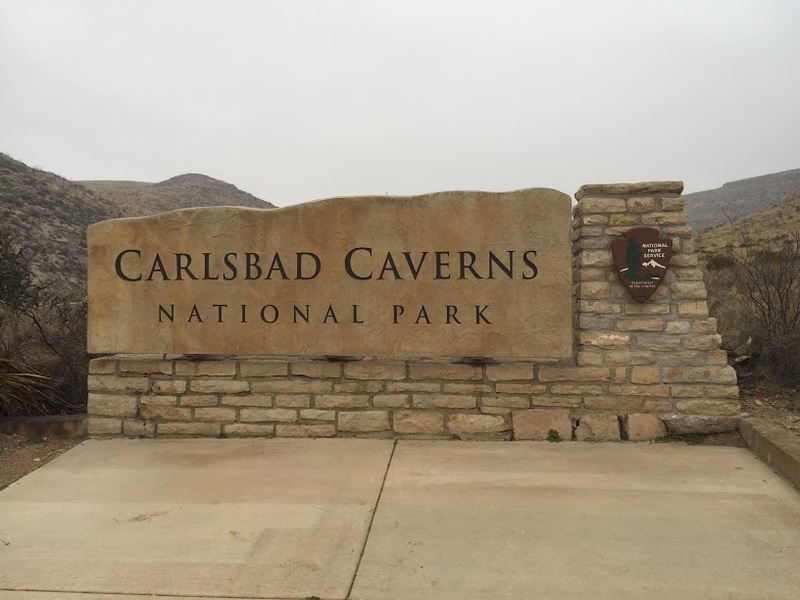 This entry was posted in Travel, USA and tagged Carlsbad Cavern, Southeastern New Mexico by lesleycarter. Bookmark the permalink. I love your life! Enjoy! I am not sure if it just me but none of the pics are showing in the post. That has happened to me in my posts before. Carlsbad is great. I’ve been there in recent years, but it’s the wonderment of my childhood visit that sticks with me. We started with the guided tour of the King’s room via elevator and then went back to the top and enjoyed the walk. I hope we can make it back with the girls as they grow up so they can continue to appreciate it. They amazed me in how much they were soaking in what was around them. Maybe they will have that same sense of wonderment that you did when they grow up! I certainly hope they do! It is! I hope you get a chance to go someday! The images in this story don’t appear on my Macbook or iPhone. They only say Inline image 1, Inline image 2, etc. Anyone else having this prob? Yes. No photos on my Mac either. (This is Lesley’s husband, Darren): Sorry folks, a bit of a technical difficulty when we published it. Should be all good now! Great and thanks Darren for letting us know! Same with me unfortunately, I sent an email to let them know. I hope it can be fixed easily. If not, I’ll get permission to post the images up on my blog! I went to Carlsbad as a kid, and while I loved it, it was almost a bit scary for me because of just how huge that main room was (I have, like, the opposite of claustrophobia). I would love to go back as an adult! What an awesome experience for your kids! Judging by the first photo, I definitely want to make a trip to Carlsbad sometime. However, that first photo is the only one that downloaded/that I can view, and unlike the other folks who commented on this issue, I’m not using a Mac. I have a Toshiba laptop with an older version of Windows. Thank you! 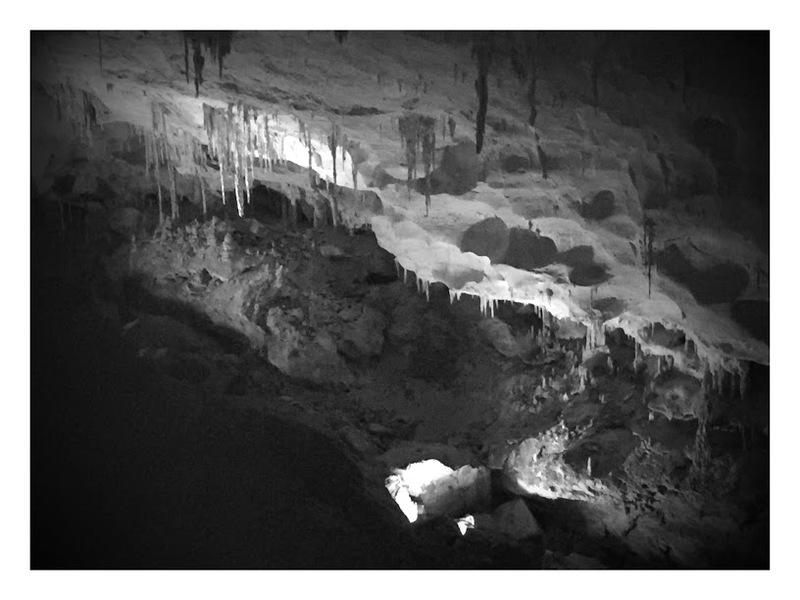 I hope you get a chance to see the Caverns, and hopefully we can sort out the image problem! The caverns is an awesome experience. One of my favorites parts of the West. Thank you! Mine as well! I haven’t been to the Caverns since I was a kid. We did the bat breakfast one year which was great fun (except for getting up at the butcrack of dawn) and then we took several relatives over the years we lived in Carlsbad. Once, on a school field trip, they had all of us sit in the main room and then turned off the lights! I have never known such complete darkness. It was very cool. NM has a ton of great places to see! I worked out on the west side of the state at a backpacking ranch for a summer. Thanks for reading! What a good idea for a cold day! I accidentally discovered that myself once, traveling through Great Basin National Park in eastern Nevada in below zero temps. 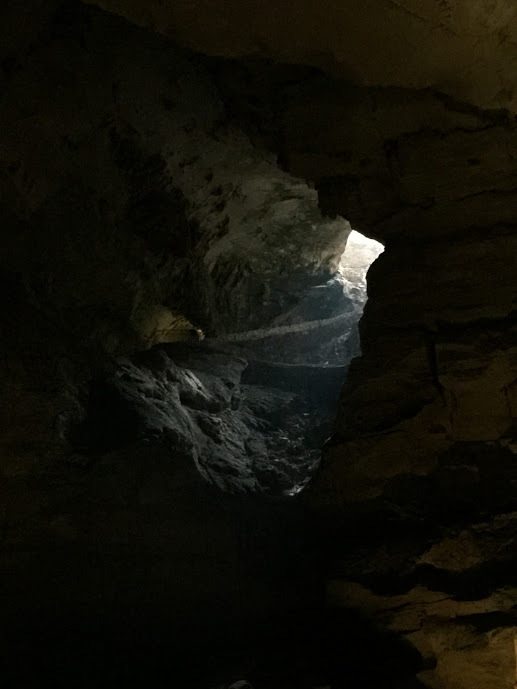 I had not originally planned to go into Lehman Caves, but stopped at the visitors center. Then the Ranger explained that the cave stayed right around 50 degrees and it sounded like a beach vacation, so I went in! I love the shots of your kids so interested in the walls of the cave.